When I was in my redhead teenage years, I had wonderful skin. Most of my classmates at that time were struggling with acne, but (thankfully) I wasn’t. The only spots I had on my face were freckles and I liked them. My skin was very dry. It would get itchy and flake, so I always made sure to put moisturizer on my face and body day and night. Then, I started wearing makeup in college. My friends first introduced me to mascara. Side note: As many natural redheads know, mascara is life changing! Since that moment, I started buying more makeup and experimenting with beauty and skincare products. It was a lot of fun and throughout the years I thought I was doing the right thing for my skin because it looked healthy and beautiful. I’m 28-years-old now and my beautiful skin has changed. I now have sensitive, combination, acne-prone skin. I was so confused at how this happened because I thought at my age this wouldn’t happen. How could someone who never had acne as a teen get acne as an adult? I eat healthy, exercise every other day, I never smoke and I rarely drink. I only drink tea and water and live a pretty stress-free life (even though I’m in nursing school). It just didn’t make sense. 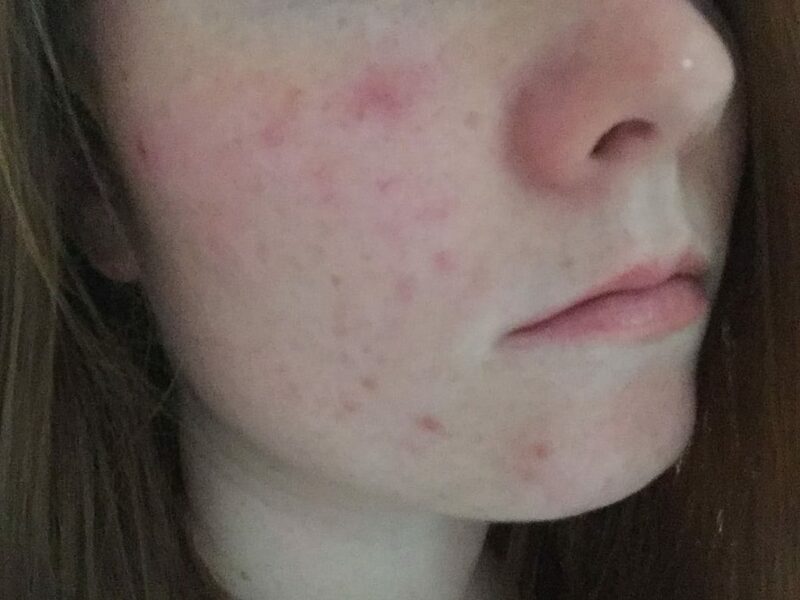 I tried all the acne products at the drugstore and natural home remedies, but nothing worked. It was getting worse and worse and felt like it was spreading. My skin was red, blotchy, dull, and broke out frequently all over my cheeks, neck and jawline. What was really bad was if you looked really close, you’d see that all of my pores were clogged. I could actually see the junk that was in Ph and could squeeze it out if I wanted to; it was really disgusting. Some pimples were so deep and painful I couldn’t do anything about them. I had never experienced anything like it. I would typically get a pimple or two on my chin (around that time of the month), but nothing to this extent. The only way I felt comfortable enough to leave the house was to put on foundation and concealer. I was also very good at my skin care regimen. I cleanse my skin with a gentle cleanser, tone and moisturize twice a day. I tried all kinds of ways to treat my skin woes from expensive cleansers and creams; natural remedies like apple cider vinegar and coconut oil, and of course special treatments like pore strips, masks and spot treatments. That’s just to name a few. I’ve tried them all. I tried cutting dairy and sugar out of my diet and that didn’t work either. Nothing seemed to work. 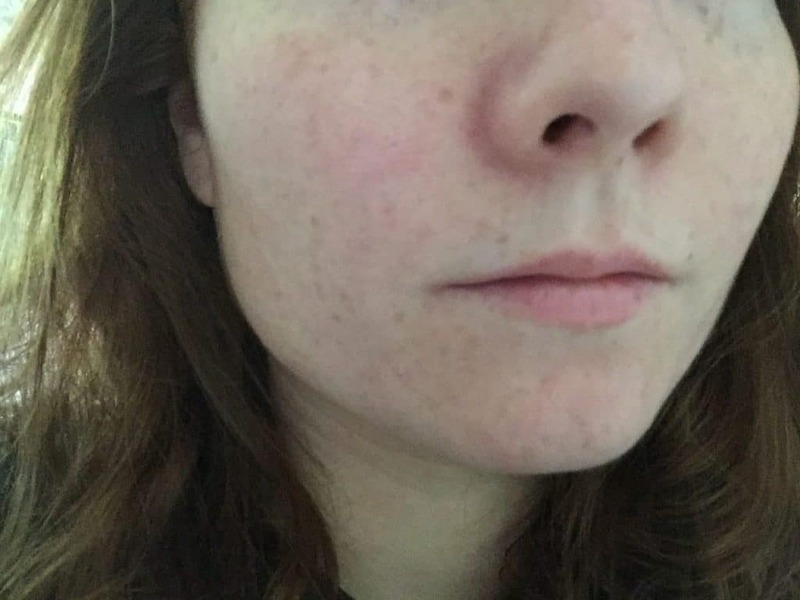 My skin stayed inflamed and exactly the same. I became rather depressed and considered going to a dermatologist for help. Since nothing worked, I was ready to try something really different. I finally figured since I never used any products on my face as a young redhead that this could be the culprit. I tried a face detox for a month. This meant that I didn’t put any products on my face for a whole entire month. My face would see nothing but water, air and sunlight. Oh, and mascara because I can’t live without mascara. I used micellar water to remove the mascara at night, but that’s all I did. The pictures should speak for themselves! I noticed a difference after only one week. My redness started going away and my pimples started drying up. I still have one large pimple on my cheek, but I’m being patient with it. My pores still look a little enlarged, but they aren’t clogged anymore. The texture on my face looks a lot better. Another bonus is: I save so much time in the morning getting ready. I’m really surprised my face didn’t break out at all during this process. I guess the human body has a way of healing itself naturally. I still have some redness and acne scarring that I’m waiting for it to fade, but overall I’m so happy with the results. It was very difficult at first walking out of the house bare faced and wondering if people would say anything, but no-one did. Bye, face makeup. I don’t miss you. I understand everyone has different skin, but I highly recommend a face detox if you are experiencing the same skin problems. Sometimes the foundations, creams and potions you think are helping are actually the biggest cause of the problem. *These were actual results with real photos. Nothing was enhanced or changed in the above photos.